Approximately 60% of Arabic-speaking Internet users dislike using an Arabic keyboard, according to Yamli, a Massachusetts-based startup that launched last year. CEO Habib Haddad explains that many users have to use a Latin keyboard for their jobs or school, which makes the keyboards impractical (and many think they’re just hard to type with). When it comes time to type in Arabic, many Internet users have adopted a phonetic web language that spells out Arabic words with these Latin letters. The result, Haddad says, is messy – especially when it comes to making sounds that don’t exist in English. Yamli has built a system that solves this problem. 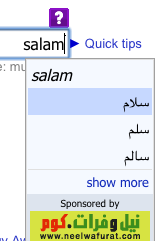 Users enter words phonetically into a special text box that displays a list of matching words that are written in Arabic. This allows them to keep using their Latin keyboard, without having the resulting text look like gibberish. Because there are around 22 dialects in the Arab world, Yamli has to deal with multiple different phonetic spellings, which Haddad says it does with around 95% accuracy. The company launched an Arabic frontend to Google in November 2007, and released an API in March 2008. The system was recently integrated into popular Arabic portal Maktoob (which Haddad likens to an Arab Yahoo). In the future, Haddad says that the technology will be applied to other platforms, like mobile phones. And it only has two employees, both co-founders. The company seems like a likely acquisition target for Google or any other company looking to expand to Arabic-speaking nations, where Haddad says development has been relatively slow.